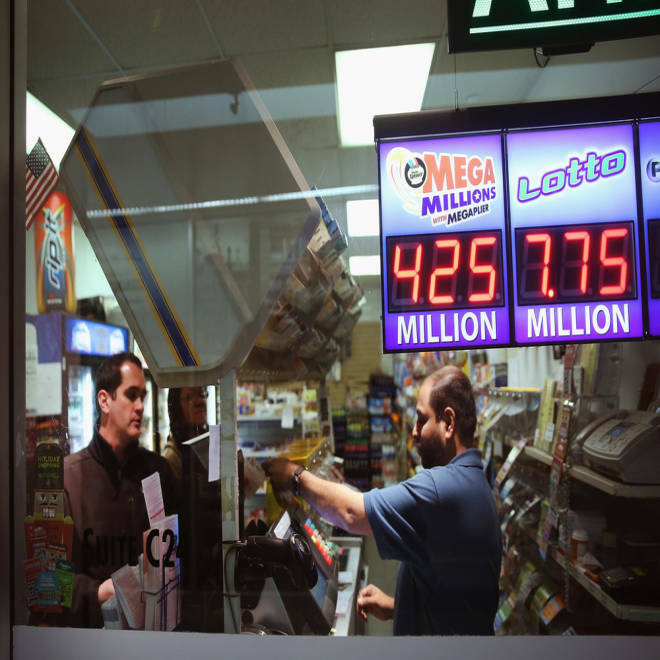 A clerk sells Mega Millions lottery tickets at a convenience store in Chicago on Friday. The Mega Millions jackpot soared to $550 million -- the fourth-biggest prize ever -- early Saturday after no winning ticket was sold. Heavy sales had boosted the prize to $425 million for Friday's drawing, but even with all those tickets sold, nobody picked the winning numbers: 19, 24, 26, 27, 70, plus the Mega Ball number 12. California Lottery spokesman Mike Bond confirmed that the prize for Tuesday's drawing would be $550 million. That's Mega Millions' second-largest jackpot ever, trailing a $656 million jackpot in March 2012 -- and the fourth-largest lottery jackpot in U.S. history. Mega Millions had been outshined somewhat by the massive jackpots of the Powerball game, which doubled ticket prices to $2 in January 2012, enriching jackpots as it also added a number of secondary prizes. This jackpot has been growing since Oct. 1 and now has rolled over 21 times without a winner. In New York state, tickets for Friday's drawing sold at a pace of $500,000 an hour in the morning. The state's lottery spokeswoman, Christy Calicchia, said sales are normally between $60,000 and $70,000 an hour, The Associated Press reported. The winning ticket must match the six numbers drawn, and about 32 percent of the possible combinations of numbers have been sold. Mega Millions is played alongside Powerball in 43 states, the District of Columbia and the U.S. Virgin Islands. Jeff Black of NBC News and The Associated Press contributed to this report. People wait in line to buy lottery tickets at a newsstand in Los Angeles on Friday.